There’s some new werewolves in the game and their story is nothing like Twilight. 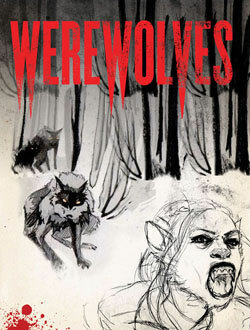 “Werewolves” is an art book that takes the story in a whole new direction. Co-stars of the Twilight saga and center-stage in a spate of new movies and TV series, werewolves are poised to eclipse vampires as pop culture’s IT creature. Werewolves takes the form of an illustrated journal that plunges readers into the life of a high school girl-turned-werewolf as she makes her transformation. After Alice and her brother are bitten by what they assume are large dogs, her journal/sketchbook becomes a place for her to record the changes they start to experience her socially awkward brother falls in with some creepy new friends, and she surprises herself with new strengths and instincts and a suddenly nonvegetarian interest in raw steak. Joining the werewolf pack that bit them, they discover the pleasures and dangers that come with the cycles of the moon, including threats from “hunters” who stalk them, a researcher seeking a cure, and escalating violence within the pack itself. With a fresh take on the lore and legend, Werewolves gives fans a ripping tale to sink their teeth into. In “Werewolves,” Jessup’s collaboration with illustrator Allyson Haller. Its central character, Alice Carr, must use wits and courage to “get out of a horrible situation with the crazy werewolves,” Jessup says, as opposed to waiting around for her controlling vampire boyfriend to rescue her again. Personally, I think this book sounds fantastic. I am one of many women that despises the pathetic Mary-Sue that is Bella Swan.